Do you have a good Etsy shop to share? Please let me know in the comments! I'm always digging for new finds. I had a few of these bookmarked as well!! I love everything...that hammock!! I am obsessed with etsy...I NEED that hammock in my life! Etsy is truly the best...lately all my finds have been for baby, so not so much your speed quite yet! (c; It's amazing how the internet has completely changed how I shop for *everything*...I LOVE IT! looove that hammock! etsy is the best for great finds like that! Omg that HAMMOCK! On my shopping list immediately. 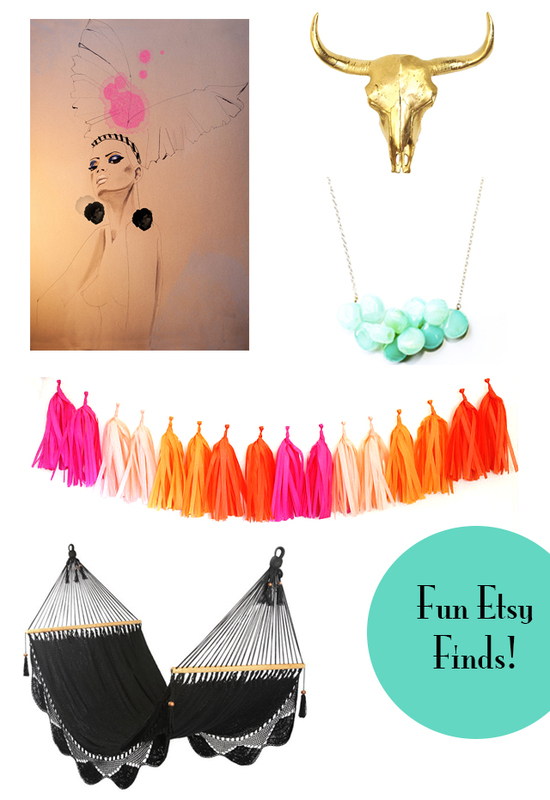 That tassel garland makes me want to party :-) Such fun colors! love that tassel garland. a bunch of my friends have it in their apartments and it is just so striking and such a fun pop of color! Oh my goodness Art By Lola is amazing..love that print. Another good print shop I like is Peggy Wolf Designs. Such pretty artwork! Oh, wow! I love Etsy and find myself checking in probably too frequently to see what they have new! I love vintage things & antiques and am a "touchy, feely" kind of shopper. So, like another commenter stated, I also am amazed how the internet has completely changed how I shop for everything. While I still like to do so, rarely now do I frequent an antique shop. So great that you're a Etsy Lover... I think we can all relate! I just found some cute house numbers at DavidMeddingsDeSign, a cute vintage chalkboard at ZacoCreations and started selling my own artwork at HillaryTimmArt. Love Love Love Etsy! Love that black hammock. Love Etsy I have a shop there as well as my own website. Die Sacen sehen so toll aus. Finde es immer wieder schön zu sehen, welche Ideen du da umsetzt. Einfach klasse. that hammock is everything! heading over to art by lola-that is a very cool piece!